Among the dense forest near Koblenz is located Stolzenfels Castle. This magnificent medieval castle is probably one of the most popular along the Rhine. Stolzenfels Castle is located about 3 km south of downtown along the river Rhine and has a beautiful view of the neighborhood bearing the same name. Stolzenfels Castle was erected in 1259 as a military fort to protect the area and mostly collect tolls from passing on the Rhine commercial cargo ships. Any craft that you want to pass along the river, had to stop and pay the specified portion to pass through the area. In the coming years and centuries the Stolzenfels Castle expanded, was renovated and became a more and more beautiful fortress. In the 30-year war it was successively occupied by French troops, the Swedish, and finally in 1689 was finally destroyed by the reanch during the 9-year war. The ruins of Stolzenfels Castle remain to remind us of the military defeat in the next 150 years. New Life for the citadel comes after citizens of Koblenz give it as a gift to Frederick William IV of Prussia. After 1826 the prince began to recover Stolzenfels Castle to make it his summer residence. Construction of new Stolzenfels Castle lasts between 1836 and 1842. The Prussian king demanded the castle be built entirely in the tradition of Romanticism in architectural construction. 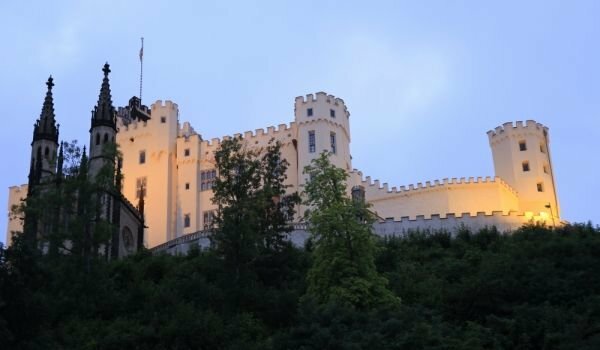 With the help of the then famous neoclassical architect Karl Friedrich Schinkel, who worked together with masters Stüler and Persius, Stolzenfels Castle was completely renovated in the current neo-Gothic style. The main objective was to create a unique romantic mansion, which reproduces the ideas of medieval knighthood. For this purpose, the architects built a special place for tournaments. Stolzenfels Castle retains its medieval tower and the orange façade creates a peculiar feeling of serenity. The oldest part of the castle is the fort with its firewall, built around 1250. The second residential tower was built around 1370. Today the castle visitors can see a rich collection of armor and weapons, and one of the earliest collections of old German ceramics. The entire interior is made up of authentic furnishings dating from the 14th to the 19th century. The most notable area of Stolzenfels Castle remains the great royal hall, which has two levels and is a beautiful example of the knights of the castle dining in Marienburg Castle.